In the sixth month the angel Gabriel was sent from God to a city of Galilee named Nazareth, to a virgin betrothed to a man whose name was Joseph, of the house of David; and the virgin's name was Mary. And he came to her and said, "Hail, O favored one, the Lord is with you!" When the child Jesus is under attack. What does he do? He runs to His Blessed Mother Mary. If we love Mary, if we are devoted to her... then we can never lose faith in Her Beloved Son. In how many ways does our devotion to Mary strengthen our faith? If we believe what the Gospel tells us about her -- and how could we not and still call ourselves Christians -- then we can have no doubt that Jesus is the Son of God. Mary is the participant and the witness of the greatest miracle of all time. She speaks to us through her silence and humility. Look at the attacks against the Church. And think -- how much more effective would they be without the protection of the Virgin? God the Father. How do we know this is true? Because of Mary. Christ the Son of God. Mary affirms it. What kind of monster would dare attack a woman with child? We know the answer from Revelation -- a dragon. Think of all the attacks on the Church by atheists, secularists, feminists, socialists. Why have they failed? Mary! This title is very relevant today with what's happening inside the Church as your post on that "Dominican" nun shows. 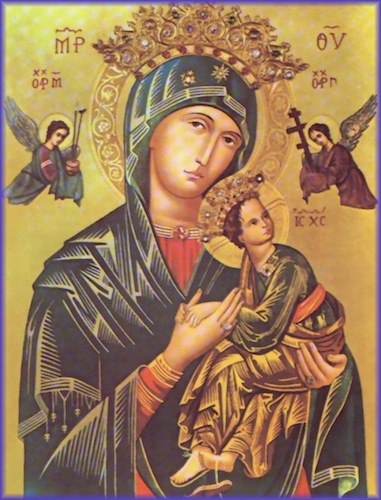 I was thinking that devotion to Mary is like a spiritual vaccine against some of these heresies. It is like she is in heaven protecting us from harm. I can't help but think that if some of the Protestant churches were more devoted to Mary that they wouldn't be so quick to fall for the tactics of the people that want to destroy the Church. Women's ordination and acceptance of homosexual activity are just the starting point. The hidden agenda includes such things as goddess worship and is much closer to neo-paganism than the Christian beliefs of the Catholic Church. This is really just radical feminists way of attacking Christianity because they view it as being "patriarchal". Like the woman that went before King Solomon falsely claiming a child that was not hers, they don't care about the fate of the Church. I am very disappointed at St Scholastica's for inviting her. But I guess having the title "OP" after your name can be deceiving. I pray the Congregation for the Doctrine of Faith will take swift action on her group. Yes, I agree with you. Mary has a special mission given by Her Son which we have seen unfolding since the second half of the second millennium. Her role as Protectress of the Church is evident in the different approved apparitions. We know she has asked for prayers for the clergy, but also for faithfulness to the Church, notably in Quito, Ecuador. Keep these articles coming. :) It's good to know what to fight within as well as without. Reid's visit seems to have been arranged by a group called "World Conference of Religions for Peace". The Philippine group associated with them is Religions for Peace Philippines. The WCRP is a "ecumenical" group associated with the UN. I'm highly suspicious of them. I'll try to find out more about them. My guess would be that they get their funds from Rockefeller Foundation, Ford Foundation and similar groups. That was quick. I did a search for "World Conference of Religions for Peace" and "foundation". And immediately found a $300,000 grant from Ford Foundation "for the Global Women of Faith Network to mobilize and equip women in faith communities worldwide". I'm sure Barbara Reid was staying in a very nice hotel in Manila with that kind of money backing this feminist indoctrination movement. And its all neatly disguised as a Catholic religious talk. ... and then they pretend to be these poor repressed women fighting for their rights against the "patriarchy" when really they are backed by the big corporate world. Hi M. I have some more information for you. Archbishop Fernando Robles Capalla is mentioned on the "World Conference of Religions for Peace" (WCRP) website as a "honorary president". He is also on the Vatican's "Pontifical Council for Interreligious Dialogue". So maybe he just doesn't realize how dangerous this organization is. Although he should. Also, "Religions for Peace Philippines" has its offices at University of Santo Tomas. Again, they should realize how this group works against the Catholic Church. WCRP gets funding from all the big foundations - Ford, Rockefeller etc. This is according to their annual report. They also receive funding from UN agencies like UNICEF. All the warning flags are there that this group has more in mind than simply "peace" and getting various religions to talk to each other. The goal is to water down our Christian faith with so much relativism and ecumenism that there is nothing of substance left. There are plenty of other Catholic organizations that are listed as supporting WCRP, including many archbishops from around the world. Of particular note are the Maryknolls. They are infamous for their support of socialist ideas. One of their priests, Roy Bourgeois, has recently been in the news for his support of women's ordination. What do you think of Archbishop Capalla and San Tomas University. Are they generally orthodox in their views? Thanks Michael. I thought about it before replying. Both the Abp. and UST are orthodox. In fact UST recently disowned a former student whose blasphemous artworks were displayed at the Cultural Center of the Philippines. They even supported the filing of a case against him. I think both the Abp. and UST are not aware of the red flags you've relayed to me. After all, looking at the WCRP website, it seems harmless on the surface. Sometimes I think the Church is put in a hard position. If they were acutely aware of the information here presented, and rejected the WCRP, they might be accused of being 'inclusionary' and anti-diplomacy, and thus, "anti-peace." Maybe they are tolerating it to a certain extent until something completely unacceptable comes their way, which of course, is dangerous. It's like letting the disease get worse until it is too late. Which is exactly where the Enemy wants the Church. To add: I'm glad good steps are being taken such as the dismissal of Roy Bourgeois, and, also recently, the Vatican calling to Rome the Mexican bishop who has ties to pro-choice groups. As we were warned in Akita, "the Church will be full of those who accept compromises." I mean, this is already being fulfilled! We have to pray for Holy Mother Church. Dear M. Thank you for your reply. I'm glad to hear that there is no willing cooperation on the part of those involved. I'm sure they are just trying to reach out in the spirit of ecumenism. And I agree with your comments. As you say, WCRP looks benign on the surface. But I'm sure they are not. There is a danger to ecumenism. It can lead to relativism which is the goal of people like WCRP. It is like feminism in the way that it can be used to covertly attack the Church. I'm sure you are familiar with how the communists work to infiltrate and subvert organizations from within. The secularists use the same methods. You know how the communists have used the peace movement. Now we see the secularist using the peace movement against the Church. There are many similarities. The communists wanted to setup a one world government; the secularists want to create a one world religion. With regards to Fr. Bourgeois, I'm afraid that the Maryknolls are protecting him. Pope Benedict XVI and the Vatican are doing all they can. The Maryknolls should have taken care of this problem long ago. There are many dissenters within the Catholic Church in America. I believe the Pope is doing all that he can without causing a great schism within the Church. I suspect that Pope Benedict was elected with the support of Cardinals from outside the US who are concerned about the direction of some of the American bishops. I must confess that I was not a great fan of Pope Benedict at first, but he has converted me. Under his leadership and guidance I have become a better Christian. God bless our Holy Father! By Marie Carre ( https://www.tanbooks.com/index.php/AA-1025 ). With other books on the back burner, I haven't read it myself but, with what you brought up, I might do. M. There was an American woman named Bella Dodd who was a leader in the American Communist Party for many years. This was in the years of Stalin. Later she left the party and became a Catholic. In the 1950s she testified before Congress that "more than eleven hundred men had been put into the priesthood to destroy the Church from within" by the communists. And that “right now they are in the highest places in the Church”.